...the marriage amendment, which may have spurred Democrat success in places where student turnout – fueled by massive anti-amendment efforts – brought more-than-usual Democrat votes to the polls. But could we have known then that Iraq and the President’s numbers were going to drag Republicans down, come November? Could we have honestly predicted that the Bush administration – with all their Rovian strategery – wouldn’t turn that around somehow? Funny, it was exactly July that Paul predicted that the amendment would backfire on the Republicans. And it was just about weekly all last year that Paul pointed out that Iraq and Bush would drag Republicans down. This was not outside of GOP control. They could have controlled this by resisting the temptation to score political points by having Wisconsin take a vote on the lives and families of gay people. Republicans had control of the state legislature, and had the ability to rise above this kind of political pandering. But they didn't, and it backfired. But to say that it wasn't in GOP control is absolutely asinine. Republicans wrote the amendment. Republicans passed it with their legislative majorities. Republican candidates proudly trumpeted their bigotry, but it didn't bring them any election day triumph. Tough luck. When you gamble and lose, at least accept the blame. In the end, it was this strong record of failure that cost Republicans in November. It's shocking that GOP talking heads still haven't figured it out. The Democratic Tsunami didn't come out of nowhere. Republicans made it, and lost because they consistently made wrong decisions on pretty much every issue. To blame it on fate avoids accepting any responsibilities for the shortcomings and failures of the last 12 years. It also means that the GOP still hasn't learned anything, which only bodes well for maintaining and increasing our majorities in the future, because Democrats - unlike Republicans - will craft a record of results for the American people. Quietly slipping under the radar this election season was a finding in October that ranked Wisconsin quite favorably on workers' compensation premium rates. Conducted by the state of Oregon's Department of Consumer and Business Services, Wisconsin, when ranked against all states and the District of Columbia, was 35th, improving from 33rd in 2004. Employers can reduce their workers' compensation rates through accident prevention, safety training, and by helping injured workers return to work. North Dakota in 51st place and Indiana in 50th led all states. Let's remember this the next time WMC whines about the cost of doing business in Wisconsin or about 'unfair' safety regulations that benefit workers, and in turn, the employers. While we are at it, Morgan Quitno Press, which is in the state and city ranking publications business, ranked Wisconsin the 14th Most Livable State in 2006. Morgan Quitno also has ranked us the 8th Smartest State for 2006-07. They use twenty-one factors ranging from student-teacher ratios, to testing, to graduation rates. We beat all of our neighboring states; Iowa by a little, Minnesota, Illinois and Michigan by a lot. I am not sure how accurate these rankings are, but one thing I am sure of is that my buddies at WMC never told you about them. The League's positions on legislation, which are a result of the state's municipalities' consideration of what best protects their collective interests, apparently are too liberal for a majority of Mequon's City Council. None of us can pull out of the funding of public education, kids or not. When the legislature decides to name some new state bird, song, or insect, you cannot refuse to participate in the cost. No bid contracts to thieves like Halliburton. Our form of government is the evolution of the social compact that emerged from the Magna Carta. It is based on an agreement that we are all in this together. We have a right, even an obligation, to challenge government programs and policies, but we do not have the right to opt out. Our form of government does not provide a list of government functions like a restaurant menu. Lobbying, like fire service, public health, and snow plowing, are all services Mequon can choose to provide. Fine, if you want to pull out of the League for political reasons, (that is what Madison's present mayor foolishly did with the United States Conference of Mayors), but do not use a bogus argument that attacks the fundamental nature of our government. You pulled out because you do not like the policies. Say so. Despite a national buzz in recent years about the benefits of cooperation, those who have tried it know that any government consolidation is an arduous process. But for fire departments, who would be asked in merger to blend something much more personal than trucks and stations and nozzles, the idea is particularly challenging. DEERFIELD - In a move some say strikes at the heart of what it means to live in a small community, the Village Board is considering disbanding its police force and contracting with the Dane County Sheriff's Office to patrol the village. Both articles focus on the emotional issues, loss of community identity and tradition. Both articles focus on the economic benefits and the hope that the pooling of resources will provide higher levels of service. In consolidation or merger, one of the parties often uses the resources of the other to cover administrative expenses, and does not provide the expected level of services. To offset this, the provider should err in providing higher levels of service. In merger, the objective of services is often forgotten. Combined with the fervor of merger and the loss of administrative responsibility, major functions wither and the community suffers. A perfect example of this is the merger of the Dane County and City of Madison Health Departments. The loss of public health nurses devoted to Madison neighborhoods is devastating. Their loss of participation the Neighborhood Resource Teams is one reason that gang and violent crime rose so rapidly in the last three years. There is the cherry-picking. The urban center, Milwaukee, Madison, Oshkosh, and Green Bay has to provide a full compliment of services. Madison taxpayers do not have the right to opt out of the highest level of fire service for high rise buildings, the Civic Center, Monona Terrace, or the extraordinary cost of dealing with drifters, most with emotional or drug dependency problems, who collect on State Street. Yet adjacent communities can pick and choose which services to share. In anticipation of the critic who says Madison does not have to take care of the drifters, I remind you that more than one arson fire was started by a drifter who was purchased a bus ticket to Madison by another local unit of government and disappeared into the night. Common Sense Drought in Stevens Point Kills "Urinetown"
Obviously the folks in Stevens Point will never get the joke. And no one in Stevens Point ever shared Everyone Poops with their four year old. Anyone old enough to appreciate the Music Man is old enough for Urinetown. Unless, of course, they never did the pee dance and they believe this planet has an unlimited supply of fresh water. Update: Disclosure- Rachael played Little Sally in the University of Michigan production of Urinetown. 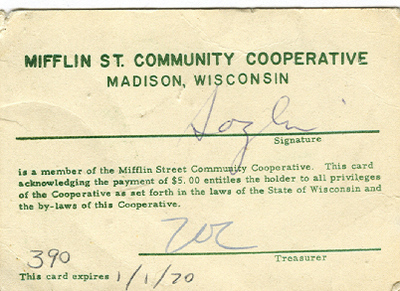 Here is the link to the History of the Mifflin Street Community Co-operative. A few years ago I turned up at a fund raiser for the Mifflin Street Co-op, and spent several hundred dollars on a few shares of stock signed by some fictional revolutionary named Delgado and an old banner from The War At Home. From 1966 until 1969 I shopped at the White Front Grocery at the corner of Mifflin and Basset. That winter of 68-69, when word came that the Caruso family was going to close the business, a dozen of us decided it was time to form a food cooperative. The rest is history. And the history was not always pretty, but the Co-op served as a barometer measuring the status of the Madison left for many years. From the first Mifflin Street Block Party in 1969, which was not sponsored or organized by the Co-op, to the welfare demonstrations, to the struggles against dangerous drugs, it reflected the concerns of the neighborhood. The fights over carrying soft drinks, tobacco, meats, non -organic food products, processed food and anything digestible or indigestible seemed to never end. In fact, at some point, there was at least one member of the Mifflin Street Co-op who opposed the sale of every consumable food product offered to the public in the past thirty years. Cleaning products, dog and cat foods, and, of course, beer were included in the frays. The end of the Co-op does not trouble me. There are other platforms and more important battles to wage. That the Mifflin Street Co-op was a vehicle to unleash in those struggles is not insignificant. But the energy to fight for justice, safe food, and neighborhood strength can be waged in other forums. The Co-op will survive in principle. There is its offspring, the Willy Street Co-op, and such deserving individual successes like Golden Produce. The real lore of the co-op was co-op workers like Bob Golden driving to Chicago to purchase fresh produce with a few hundred dollars. He usually came back with the intended lettuce and grapes (if there was no boycott that month) as well as the spinach, peaches and ginger. But the real adventure would be the items not on his shopping list, fruits and vegetables that most members had never seen, let alone tasted. You probably noticed that the link to the Co-op website works but there is not much there. If you go to the history of the Mifflin Street Co-op you will find nothing but a notice that it is under construction. A significant partial history used to be available in a PDF but it has disappeared. How appropriate. I still have my membership card. ...It has been obvious for some time that, as President of the United States, George W. Bush is in very far over his head. He does not know how to use power wisely. He will now have a Democratic Congress to restrain him, and, perhaps, to protect him—and us—from his unfettered impulses. This may not be the Thanksgiving he was looking forward to, but the rest of us have reason to be grateful. Last week the City of Mequon decided to drop its membership in the League of Wisconsin Municipalities, The League's positions on legislation, which are a result of the state's municipalities' consideration of what best protects their collective interests, apparently are too liberal for a majority of Mequon's City Council. Boots and Sabers' Owen Robinson thinks it's a great idea. Although I suspect Robinson's difficulties with the League's positions are generated primarily by the League's steadfast opposition to TABOR, his list of reactions to their specific positions is illuminating. Where the League favors "comprehensive health care reform," Robinson sees "socialist health care." Where the League supports elimination of some tax exemptions to reduce the property tax burden on homeowners, Robinson sees a plot to increase taxes on business. The League will do fine without Mequon. Once they leave the League, what Mequon will have to do without are the League's comprehensive legal reference services, its training courses for local officials, its ordinance library, its publications, and its mutual insurance. Will Mequon save real money by this move? Doubtful. What Mequon has done is designed to show those lefties in Madison. The League's Board of Directors are Mayors and Council members from such socialist strongholds as Ashwaubenon, Lancaster, West Milwaukee, Wauwatosa, Lodi, Wausau, Oakdale, Ripon, Neenah, Fall Creek, Milwaukee, Neilsville, Superior, Manitowoc, and East Troy. What does this move remind you of? Right, Ozaukee County's vote to cut its UW-Extension funding to show its disapproval of UW-Madison hiring Kevin Barrett to teach that course on Islam. Where is Mequon, again? Oh, Ozaukee County. Got it. The University of Wisconsin Alumni Association published Priced Out of the Promised Land by John Allen, associate editor, in its Winter, 2006 issue of On Wisconsin. Allen provides a comprehensive examination of the increase in tuition, admission policies and the impact of state reductions in funding. Still, the Covenant recognizes an important, if inconvenient, truth: the price of attending a UW System school is rising at an alarming rate. The median family income in Wisconsin, according to the U.S. Census Bureau, is $46,351. But according to the chancellor’s office, the average family income of a new UW Madison freshman is nearly twice that —about $90,000. During the ensuing decades, the UW developed a formula for how high tuition ought to be. “The traditional ratio is that the state pays about 65 percent of the cost of running the university, and students pay 35 percent,” says Freda Harris, the UW System’s associate vice president for budget. From 1995 to 2005, as UW-Madison’s budget expanded, the state’s contribution in general-purpose revenue (money that isn’t earmarked for a specific program and goes to meet ongoing expenses such as salaries, benefits, and building upkeep) decreased. In 1996 it was $256.9 million; in 2006 it was $255.1 million.During the same period, tuition receipts more than doubled from $156.6 million to $314.1 million. The UW charges too much for tuition for in and out-of-state students because the state does not provide adequate funding. Without more state funds, the UW must admit more out-of-state students to meet revenue needs or most raise the tuition for in-state students. In either case, the UW is pricing itself out of range for families of modest means turning the school into an institution where poor kids are not welcome. Private schools like Princeton, despite their higher tuition, have more low-income students because of the need-based assistance those kids receive. There are significant numbers of Wisconsin students from low income households who do not get into the UW because they do not have the academic credentials. These students are bright enough but they do not have the academic tools because they come from school districts with limited resources. Ironic conclusion: The conservative legislators, with school districts with low property tax bases, who are reducing public spending on secondary and primary education are reduce the possibility that their constituent's children will get into the UW Madison, or any other UW campus. These revenue strapped communities are reluctant to pass school spending referendum and cannot keep their kids competitive with districts like Madison which are likely to allow the district to exceed the revenue caps.